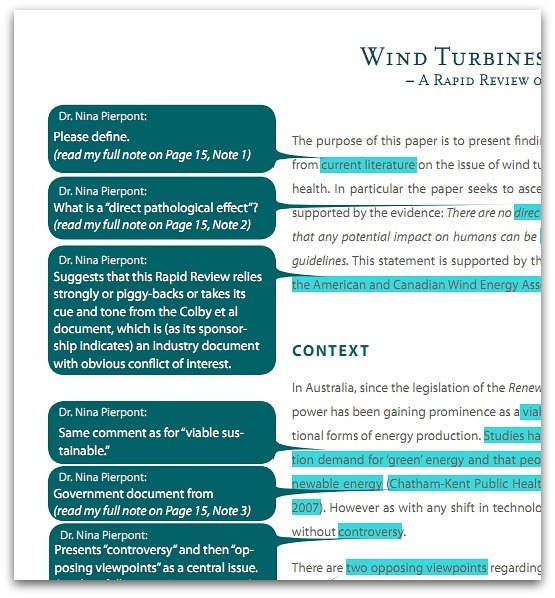 Two weeks ago, Nina Pierpont testified (teleconference) before the Australian Federal Senate’s Community Affairs Committee, as it holds public hearings on wind turbines and health (among other matters). During the course of the interview, the Senators referred to a report by the Government’s National Health and Medical Research Council. 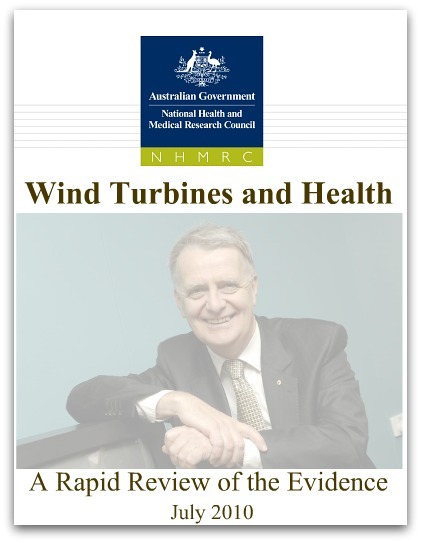 The “Wind Turbines and Health: A Rapid Review of the Evidence” (July 2010) report, which loftily dismisses Wind Turbine Syndrome as simply anecdote. The Senators asked Pierpont if she had read the report. “Yes, I have,” she replied. 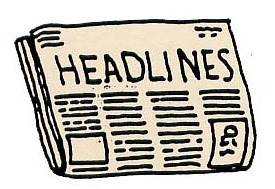 The next day, “Wind Turbines Report ‘Pitiful’” was headline news. Pitiful and dubious? Is this possible—from the government’s chief medical and health agency? You could almost hear the Senators gasp! Would Dr. Pierpont be kind enough to write a rebuttal to this “pitiful” report, they gingerly asked? Are you puzzled why we attached someone’s photo to the cover? That’s Dr. Warwick Anderson, CEO of the National Health and Medical Research Council. Although he didn’t personally write the report, Anderson has publicly taken responsibility, boldly expressing his full support and endorsement. Including support for its scientific rigor. No kidding! Which is a pity. Anderson has better credentials than this. The report is worthy neither of him nor the agency he directs. “Pitiful” is a very good word. Thank you Nina! Pitiful and dubious science: saying it as it is. Well done Nina! Enough of this condescending bureaucracy, of these “yes” men who kow tow to the all-powerful wind lobby and cling to their jobs even if that means doing away with ethics and losing their honor.